Finnegan's Irish Pub welcomes you to our special 'Himmelfahrt Whiskey Tasting Session', perfect for those who shouldn't be trusted with a bicycle! Guests will follow Finnegan's resident expert, Reike, as she guides them through the labyrinth of tastes within the five whiskeys poured. As you progress your whiskey vocabulary will develop, helping you discern the 'big' from the 'subtle'; 'dry' from 'sweet'; 'soft' from 'firm', and so on. 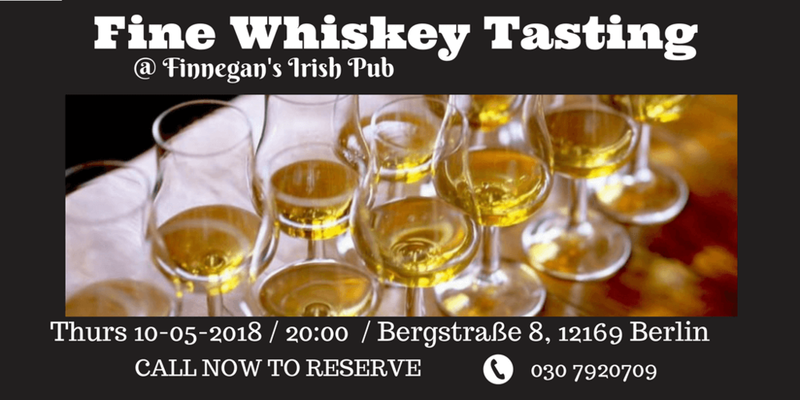 Learn how whiskey develops its flavor and how to taste, appreciate and talk about whiskey flavor profiles - all from the comfort of your favourite Irish pub in Berlin. Snacks to be served alongside engaging challenges issued by Reike to flex your new appreciation skills. * PRIZES * There will be a Whiskey themed quiz during the event with a 20 EUR Finnegan's voucher available to the winners, and a tombola held in support of Setanta Berlin GAA, Berlin's local GAA team, for one lucky winner to walk home with a bottle of something special. * RESERVE * Costs 23 EUR per guest, full amount to be paid in cash on the night. Contact Finnegan's directly (030 7920709) to reserve a space.